Abdul Ali is from Pakistan. 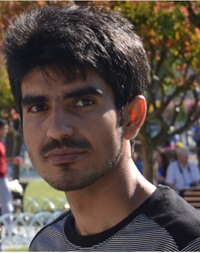 He received his Bachelor of Science degree in Telecommunication Engineering from National University of Computer and Emerging Sciences, Pakistan, and Master of Science degree in Electrical and Electronics Engineering from Bilkent University, Turkey. During his Master program, he studied the parasitic effect of the metallic towers on the radiation characteristics of the antennas using Numerical Electromagnetic Code. He also worked on a project about the feasibility study for the installation of solar panels on High Power HF antenna terrain for Turkish Radio and Television (TRT). In addition, he worked on stacked suspended plate antennas, ADL (artificial dielectric layers) for THz antennas, and reconfigurable antennas. His research interests include antenna design at high frequency, Analog CMOS integrated circuits, RF and microwave circuits. He joined the Department of Electronic Engineering, University of Rome, Tor Vergata. As a part of the CELTA Network, the goal of his project is to address the challenges related to the realization of solid state power amplifiers (SSPA) in the 0.1-1THz frequency range by using innovative transistor-based active circuit approaches.